"Musow Ka Touma Sera" written in Bambara language is translated as "The Era of Women has Arrived." Mali, a predominantly Muslim country at 97%, is ran on a strong patriarchal system. And while women are the backbone of Malian society, speaking out about gender-based violence, such as sexual abuse, is perceived as endemic to the common good. Corruption gets in the way of investigations, laws are unfavorable to women, unsurprisingly, given the staggering 8.8% seats of the parliament being filled by female. In Mali, women and girls are psychologically formatted to forgive and bear their sufferings, any suffering. They are expected to trade their individualities and negotiate their traumas to protect the identities of their rapists and the ones of their families from shame. Empathy is converted into silence, even for the most horrible acts of violence, those that are the utmost expressions of abasement. Malian women and girls are further violated, and this time, by cultural norms, the comforting voices unknowingly veiling them from acknowledging the truth. "Musow Ka Touma Sera" is an exhibition aiming to put Malian women at the forefront through the works of local photographers Kani Sissoko, Fatoumata Diabate, Oumou Diarra and Fanta Diarra. This will be Mali's first exhibition organized by a woman, showing the works of women artists on the subject of Malian women's socio-political condition. It is important that Malian women's stories are told from an authentic perspective, and for this reason, as a curator, my intention is to select visuals that have captured Malian women in a state of unease, and forward thinkingly, to bridge the artwork to a modern installation to contrast the old from the new with a mini video documentary on the artists about their works and the future of women in Mali, with graffiti tags on the walls, a form of art not widely used and seen in Mali and that genuinely amplifies activism and creates a sense of urgency to break rules and norms. 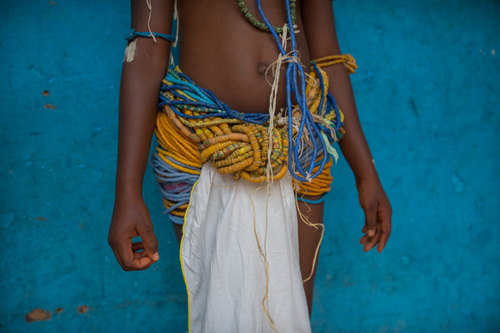 Additionally, the installation will be comprised of the most personal items women possess from modern underwear to traditional beads and wraps worn around the waist and under regular clothes. These are typically unseen by anyone but husbands, and are also referred to as "Sutura," a word that has no definition in English, but that can be understood as "to cover up" or hide. This concept of "Sutura" passed on by older generations is the main reason why women, who are subjected to gender-based violence, remain in silence, because every matter exposing one's family must be handled with discretion by fear of marginalization. To put it into perspective, one in five women will be raped at some point in their lives, while there is a chance out of 71 that their counterparts will experience a similar fate. There is a pressing need to reverse women's narrative, and refusing to see the next 1,846,000 malian women undergoing sexual abuse in silence is a duty. Fatima Bocoum is an entrepreneur, activist, and curator from Mali. She earned an Associate of Science in Fine Arts from GSU as well as a Bachelor of Arts in Media and New Technologies from Fordham University. She is the Founder of Openletr, a feminist blog with the mission to break societal and cultural boundaries to empower women to stand up, speak out and make better daily choices, all while taking on curatorial projects. The latest of which, entitled Transfiguration, was exhibited at Undercurrent Projects and featured seven women artists from six different countries. Fatima's works heavily revolve in the area of women's rights, and she was featured in Mounyou Ni Sabali, a documentary on sexual violence in Mali, which premiered in March 2019.